Let’s say your clients have a house. They’ve taken good care of it – fixed the roof when it needed it, spent money on landscaping and a sprinkler system, and completely redid the kitchen. Now it’s time to sell and the housing market isn’t looking so good – and there’s no way your clients will get their money out of it. Do your clients sell for a loss? Or, is it in their best interest to wait until the market recovers before selling? A retirement portfolio works in a similar way. When building a retirement fund, your clients will continue to invest money in it. They carefully allocate their contributions based on their risk tolerance and the investment’s reward potential, they diversify it, and they weather the storm of market fluctuations. 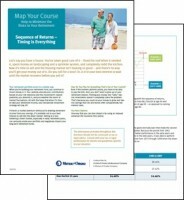 All with the hope that when it’s time to take retirement income, their disciplined investment strategy will pay off. If there’s a market downturn while your clients are drawing retirement income from their savings, it’s probably not in their best interest to sell into the down market. Selling at a loss following a down market, especially in early retirement years, can seriously erode a portfolio and negatively impact long-term retirement funds. How Do Your Clients Plan for Something That’s Out of Their Control? Even if the markets perform poorly, your clients have to be able to pay the bills. And, they don’t want to give up on their retirement dreams. Putting money into “safe,” low-risk investments doesn’t completely solve the problem. That’s because your clients count on their money to grow and low-risk savings like CDs and bonds offer comparatively low interest rates. One way that you can help your clients plan ahead is by using an indexed universal life insurance (IUL) policy. Use our Sequence of Returns brochure to help explain this concept to your clients and to illustrate how an IUL policy can help minimize this risk.